With this new publication, our team of expert analysts have gathered the most crucial insights on the global decyl oleate market. This comprehensive research report consists of the pricing analysis, market growth, dynamics, segmentation and the competitive landscape of the global market for decyl oleate. For data analysis pertaining to any market, we carry out an exhaustive research program to gather information from various trusted sources. This data is then passed through a tough validation funnel in order to get the most accurate market numbers. Once the information is curated, it is put into a systematic format of the report, which makes the reading and understanding of the market much easier for the readers. This proven and tested methodology has been adopted while preparing this report on the global decyl oleate market. Market segmentation of the global decyl oleate market is done on the basis of various parameters such as source, application and also the key regions of the market. The segmentation section holds a lot of importance in the research process. It bifurcates the market into different parts, with the help of which every part of the market can be focused on and analyzed. It also includes an individual analysis of every segment as well as a comparative study. To give the research study a logical flow, the report begins with the executive summary and introduction of the global decyl oleate market. The summary gives an idea to the readers as to what is being further projected in this report. The introduction includes the basic definitions of the market as well as the segments it is divided into. This is followed by a taxonomy and an individual analysis of all the segments. Another important section of the report is the competitive landscape. It briefly depicts the company profiles of some of the key players and a strategic overview of mergers and acquisitions along with companies’ expansion plans across regions. All this data contributes to the final market numbers. Apart from including these factors, the team of expert analysts have also taken into consideration the various macro-economic indicators such as decyl oleate market outlook, gross domestic product and other pointers to arrive at the indicated market numbers. Top-down approach has been used to counter-validate the reached numbers in the decyl oleate market, while bottom-up approach has been used to determine key market numbers. Weighted average selling price is considered to estimate the market size of various segments mentioned in the scope of the study. The country price is captured with the local currency. The local currency figures are then converted to USD to offer forecasts in a consistent currency standard. We have considered the latest annual currency exchange rate and also factored in the impact of the most recent economic conditions of country on the pricing of products. Prices considered in the models are standardized. The report is intended to serve all sorts of readers, be it an industry expert or a layman. The data is curated with the help of extensive expert interviews. The experts have contributed with some very crucial insights on the market. Each interview is thoroughly analyzed and average market volume is deduced and reconfirmed prior to incorporating in the report. For the forecast of the global decyl oleate market, various macroeconomic factors and changing trends have been observed, giving an idea about the future of the market. Decyl oleate is treated as a personal care ingredient. The product comes under the oleochemicals sector and is largely consumed by the personal care industry with a small amount being consumed by pharmaceuticals and other industries. It is mostly used as a key composition in many cosmetics, hair care, and skin care products. The emollient is industrially produced by the esterification of fatty alcohols and oleic acid. Due to growing consciousness among people regarding their appearance, the personal care application segment has witnessed the maximum demand for decyl oleate in the global market in the recent past. 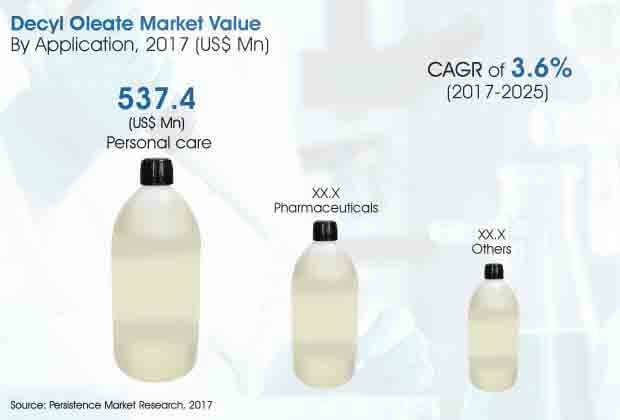 According to the results of our comprehensive market analysis, application of decyl oleate in the personal care segment is the highest, with the market value of the personal care segment expected to reach more than US$ 700 Mn by the end of 2025, growing at a CAGR of 3.7% during the forecast period. However, the application of decyl oleate in the pharmaceuticals sector is also anticipated to grow at a high CAGR, similar to the personal care segment. The pharmaceuticals application segment is expected to register a CAGR of 3.6% during the forecast period 2017-2025. Manufacturers are witnessing the preferences of people towards natural ingredients in the products they use, as natural ingredients are considered to be more healthy and beneficial with minimal side effects. Owing to this factor, manufacturers are now focusing on using natural ingredients in their product formulations. Individuals are also extensively following the vegan cosmetics trend, owing to which, decyl oleate is becoming the first preference for manufacturers, as it is derived from vegetable oils. Another demand arising from the personal care segment is for anti-aging products. The baby boom generation in many regions is reaching maturity. This has increased the demand for anti-aging products in the global market. Also, problems linked with sun exposure are on the rise in European countries. Hence, the demand for sun protection products is also witnessing a surge. Such factors have in turn resulted in increasing sales in the decyl oleate market, as decyl oleate is exclusively used in ant-aging and sun protection products. As the young population keeps increasing, their demand for the preferred products will also continue to increase. All the aforementioned dynamics indicate that the global decyl oleate market is expected to experience a stable growth in the foreseeable future. High import tariffs levied on imported chemicals and other products increase the overall cost of decyl oleate, due to which it becomes difficult for small buyers to purchase ingredients. Also, there are some regions where the production of decyl oleate is relatively low. As a result, buyers depend on imports, which also increases the price of decyl oleate. Owing to the fluctuating economy in some nations, buyers avoid long-term contracts with prominent exporters for decyl oleate. This is expected to hamper the sales of decyl oleate in the said regions over the forecast period. Some prominent manufacturers in countries like Mexico are also focusing on the export of decyl oleate to cater to the increasing demand across various regions such as the U.S. and Europe. Ecogreen Oleochemical (S) Pte. Ltd.